Photo: Wilson is on the extreme left and Jonathan is second from the left. For someone who has come close to the brink of death five times, you would think he has gotten life all figured out. But 28-year-old Jonathan Kiew is quick to admit that despite the multiple health ailments and close shaves he has experienced, he still gets distracted, makes the same mistakes, and needs crises every so often to prod him back to the right path. From appendicitis to intestinal coiling (mostly a result of bad decisions), the youth worker is no stranger to abdominal issues, although he looks nothing like the sickly sort. Tanned and athletic, he has been serving actively in Youth Guidance Outreach Services (YGOS)—a Christian values based social work agency that seeks to reach out and help youth-at-risk through skill-based programmes such as sports—for the past eight years. The youth worker is himself a walking testimony of the organization’s effectiveness, having been a youth-at-risk and brought back to the fold by one of the senior staff, time and time again. Articulate and confident, it’s hard to imagine that Jon was a “loser” (in his own words), growing up as a teenager in a mission school. He remembers clearly an incident where his male classmates all purchased the same Nike bag but left him out intentionally. It was only during interclass soccer matches that he felt accepted; his natural ability at soccer was “useful” to his classmates. At home, Jon had a strict upbringing and was not close to his non-Christian parents. Yet, Jon had always been intrigued by the person of Jesus Christ from a young age. At the age of 14, he experienced intestinal coiling for the very first time after competing in a sprint event on a full stomach (of fish balls). He thought he was going to die. When he heard his mother was planning to offer incense at the temple and pray for him, he protested vehemently. “I held her hand and said, ‘Mum, I’m going to be operated on soon, this might be the last time you’d see me. Can you just please be here and pray with me?’ ”, he said, adding that while he was “very interested” in Christianity then, he was not a Christian. By God’s grace, Jon survived the ordeal and his mother even became a Christian. It was a pivotal turning point in his life as he became “stronger, faster, and fitter” and found his popularity growing among his peers. But it was also a turn for the worse as he started associating with his cousin, who was in a gang. Previous hurts and memories of how he was picked on in the past surfaced in his mind and Jon wanted to “do something about it.” “I wanted to make myself known in school. I just wanted to be noticed,” he said. His desire for recognition led him to join his cousin’s gang at the age of 15 and onto a downward spiral of rebellious behavior, which included getting into fights, selling pirated VCDs, and extorting money from peers. He was eventually suspended from school for almost a month. But God had begun work in Jon’s life. At almost every point, his conscience would prick him and lead him to question if he was doing what he really wanted and whether he felt good about his actions. God also placed a lot of different people (including relief teachers and fellow gang members) in Jon’s path to encourage, help, and challenge him to turn back to the right path. 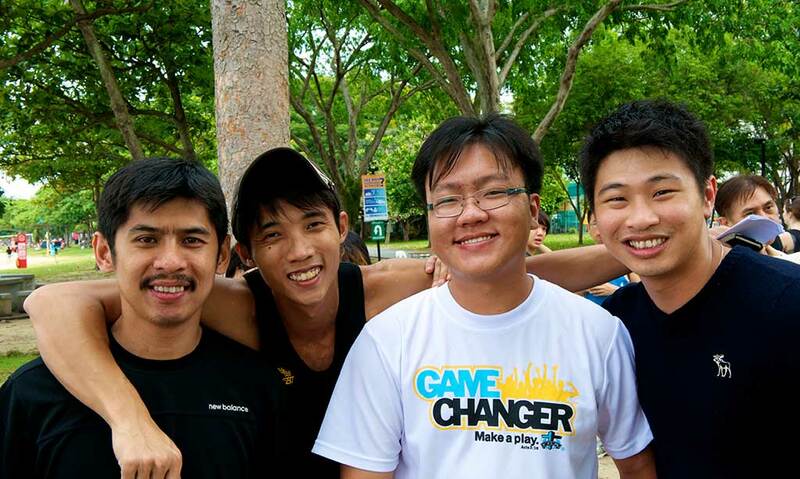 One of those was Wilson Tan, a counselor and youth worker with YGOS. Jon, who was then an abrasive and impulsive 16-year-old, first met the older Wilson in church (while skipping service) and Wilson invited him to attend the drop-in center he was working at. The invitation led to a penalty shoot-out challenge—the first to score five goals wins. If Jon won, Wilson would treat the entire youth group (about 80 to 100 of them) to Pizza Hut. If the converse happened, Jon would have to grant Wilson three favors. The stakes were clear and Jon was not fazed. “Why would I lose to an older man?” was the first thought that crossed Jon’s mind. He was an agile, experienced soccer player (he had only recently been taken off his school team due to discipline issues) and at the top of his game. Hence, he took on the challenge, certain that he would not lose. “Lo and behold, I lost 5-1,” Jon recalled in amusement. And that was to be the first and last time Wilson would defeat Jon at soccer. Many years later, Wilson shared with Jon that the secret behind his victory that fateful day was that he prayed before the shoot-out. “So it was a handicap match—there were angels protecting the goalpost,” Jon commented in jest. In spite of his disbelief and shock at losing, Jon decided to honor his word, which meant he had to start attending church service as well as the drop-in center that Wilson worked at. (Till today, Wilson has yet to claim his third favor from Jon.) His initial begrudging and unwilling attitude soon evaporated as the activities at the center were “fun” and Jon felt it was the place he could grow in his faith. So Jon kept his promise to attend the center. His first year in a vocational institute proceeded smoothly. But the good times didn’t last and he soon lapsed into bad company again, in his second year. Even Wilson’s efforts to reach out to Jon proved futile as Jon stopped attending the center, ignored his calls, and even changed his phone number. This pattern of rebellion continued into his army days, which Jon described as “one of the worst periods of my life.” It was an aimless, meaningless, and promiscuous existence. Jon even contemplated suicide at one point. One day, God impressed on Jon to contact Wilson. Despite having lost contact for one and a half years, he had been Jon’s only consistent male role model and that memory was more than enough. Wilson’s willingness to meet up with Jon was affirmation that he had called the right person. “I was relieved to hear his voice. He had been using the same number all this while,” Jon said, proceeding to recite Wilson’s number off the top of his head without skipping a beat. Jon told Wilson that he wanted to get his spiritual walk with God back on track again and asked if he could join the full-time Christian internship program in YGOS. Wilson readily agreed, despite knowing that it was a “big risk.” And it proved to be exactly the case, as Jon continued to get into trouble throughout the program. Even after becoming a staff at YGOs, Jon continued to show signs of waywardness. The first five years were very difficult for Wilson, Jon said, revealing that there were times he would not turn up for work, would adopt very “humanistic” methods to do outreach and was generally, very stubborn and arrogant. “After a while, God was no longer number one in my heart, ministry was my idol,” Jon shared. The result-oriented Jon also found himself getting into clashes with Wilson and colleagues. On one occasion, he even spat on Wilson’s leg and threatened to leave. Once again, it took another crisis to turn Jon’s heart back to the Lord. In 2010, his intestine coiled again. He was rushed to the hospital and the episode led him to question: What am I doing with my life? Why am I in ministry but behaving like I’m not? And ministry, he said, is something he was sure he would be doing for the rest of his life. “Very certain,” he added. EDITOR’S NOTE: If you know of someone who has an interesting story to share about how their faith has influenced the path they have chosen in life, write to us at contribute@ymi.today. We would love to feature them. Hopefully, i can learn that way…. haha…. Waywardness is not something a lot of kids think they will ever have to deal with as teens …. The apostle James tells us that what is usually the problem is that we underestimate the power that the Adam curse left on us …. Each of us is led astray by his own passions and when he is deceived by his own ways he falls into the trap of sin and outright rebellion !!! There were kids who saw me get punished by the class teacher and make a lot of fun …. They probably thought it was cool to poke fun of me when I was in trouble with my teachers !!!! I wasn’t the rebellious type but I cost my dad more money in my schooling for loosing text books and being careless with who I allowed to borrow mine !!!! though my dad was not outrightly mad at me it was beginning to give me problems in my thinking …. you see I saw myself as being rather careless in the way I was handling my academics and at times I knew I was not putting enough effort in my studies !!!! in my mind I was a bit slow but thanks to my mom I joined a school that taught hospitality in the hotel industry where I trained as a chef …. though I still continued to have learning issues I was very interested in the art of making hotel food … slowly I kept at it often practicing what I was learning in school at home in the kitchen on the weekend !!!! sad to say that I had no intentions of going back to school and still up to date I haven’t had much education outside my college yrs !!! !